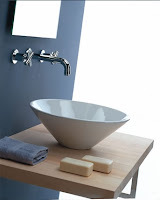 Steve agreed with me that the white ceramic vessel sink I ordered would look even better in the girls' bath, so we ordered a brown glass vessel for the boys' bath and went off to shop for counter tops. We immediately honed in on one, an ivory color with sage green and silver in it, turned to each other and said simultaneously: "That would be great in the girls' bath". It was that easy. All we had to do then was choose a vanity base. It has to be a cabinet so we don't have to touch the tiles which are in excellent shape, but I don't want anything that looks traditional. I've narrowed it down to a couple, both wood in the same tones as the doors and I have a couple of faucets in mind too. Today I painted the olive green doors in Benjamin Moore Silver Satin, a bright, grayish white and it has made a huge difference. If only all remodeling was this easy. i cant wait until i can remodel my bathroom!